« Is Arsenal really a franchised club? If you are a regular reader you will have got used to the fact that I write a piece about some aspect of Arsenal’s history, and then Andy comes up with the facts, which, if I am very lucky, suggest I am on the right line, or if not prove that he should be writing this stuff and not me. Anyway, Andy followed up my recent post about the problems at Woolwich Arsenal with this vital evidence about the average attendances. I am not sure about “liquidated” Andy – but I question anything you say with trepidation and fear. My thinking is that in the summer of 1910 Woolwich Arsenal FC went into administration, and Norris paid off every single debt, including the extraordinarily old debt owed to Archie Leitch the architect for the design (and probably the overseeing of the building) of the of single stand at the Plumstead ground. But let’s not get sidetracked from the main thing. Attendances were on the down since 1906/7. Why was this? So the promotion year gained a lot of excitement. Then the first year in the first division – high excitement. The next two seasons (1905/6 and 1906/7 saw Arsenal come 12th and 7th out of 20 clubs, but the big interest in Plumstead would have been the Cup. Cup games at the time got a much bigger crowd than league games – there was a real magic in the Cup, and in those two season Woolwich Arsenal got to the semi finals. 30,000 saw Arsenal beat Sunderland 5-0 at home on February 24 1906, while 31,300 saw Woolwich beat Bristol City on February 2 1907. What Andy’s figures show us is a club in decline. What the addition of the league position and cup round reached show us is that there would have been a feeling that the club’s time had gone. 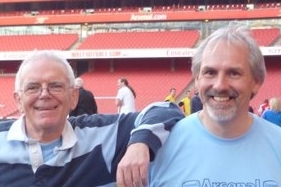 Here’s another factor – the man who had overseen our cup runs was Phil Kelso. He left at the end of the 1907/8 season to be replaced by George Morrell who survived the Norris era. As I reported in “Making the Arsenal” Morrell was under orders from the outgoing ownership to sell, and sell was what he was doing – reducing the salaries. Norris came in, in the summer of 1910, and continued to cutting. The message to the fans was clear, the cup runs were a thing of the past, and what we were getting was at best mid-table performances without star players. My guess, and I await a correction or expansion from Andy, was that after the triumphs of 1904-7 the club was budgeting for more of the same – the big push to the first trophy. But it never came, and the club had to start reigning back the money. That was why Morrell was bought in, and that is what he delivered – but not fast enough. There’s a summary of Morrell’s tenure as manager here. So Woolwich Arsenal had faced a very modern football disease – expecting the good times to roll on and on, and so continuing to spend on that basis – only to find that it didn’t happen. But 1913/14 was a triumph for Woolwich Arsenal, and for Norris’ grand design of a club in north London. 436,000 people turned up for the league games that season giving an average attendance of fractionally under 23,000. What is interesting is that the only away games that Woolwich Arsenal had that season which got a higher attendance than Arsenal’s home average (not their maximum crowd, just their average) were the London derby games against Fulham (35,000) and Clapton Orient (27,000). Without having all the figures we can guess that Woolwich Arsenal in their first season in north London were the best supported club in the league, aided by the fact that they were a novelty, and they had the underground station next door. Which raises a final question: was Norris right to move the club and to take the average home gate up from 9000, to an average that was 2,000 above its previous best – which itself was achieved in the club’s first ever year in the first division? It is an argument that takes us into the murky waters of “franchise football”. Were Arsenal, with their short journey from south to north London really behaving in the same way as Wimbledon did when they went to Milton Keynes? By chance at this very moment the possibility arises of AFC Wimbledon playing MK Dons in the next round of the cup (subject to replays), and that has led to much discussion about franchising. I’ll put my thoughts on Arsenal and franchise football in the next article. Arsenal’s past as described in Making the Arsenal – and believe me it is not what you think. This newspaper was published on 17 February 1911 so the old club ceased to exist on either Thursday 9 February or Thursday 16 February 1911 – it’s not easy to judge when “last Thursday” was. I amaze myself at what I have in my possession. I have a fair amount of these local newspaper reports from 1911-1913. Unfortunately I don’t they would be readable if I put them on the internet. Andy can you help me out on this – I am all at sea. Norris effectively controlled Woolwich Arsenal FC from the summer of 1910 onwards, and was issuing statements about the manager Morrell keeping his job and so forth. During that summer he issued various share schemes in a new company and seemed to be going around paying off people owed money by WAFC. So, is this report merely looking back on the fact that the old WAFC which had announced in public its serious financial position in January 1910, and which was effectively wound up in practice by July 1910, was then formally liquidated in February 1911, with everyone who was owed money paid up? If so, that’s the formal legal ending of something that happened in fact in July 1910. If that is what it is then, yes it is a liquidation of WAFC but a liquidation in name only since the new company had risen, done the right thing by creditors and then was fulfilling its fixtures in the 1910/11 season. Or is this not what that report implies? (Just re-read this and it looks like I am getting critical or disbelieving here, but that is not so – I am trying to pull together your research with the bits and pieces I gathered for the 1910 story in Making the Arsenal. It looks like the club was put into liquidation in early April 1910; Norris and Hall became involved at the end of the month and the liquidation process took a number of months before completion in February 1911. So the list should read that the club was liquidated in 1909/10.